The Young European Federalists of Greece and the Young European Federalists of Bavaria have set up together their project of the „Blue-White Cooperation“, a title deriving from the colours of their flags. A group of 10 participants from various sections of JEF Germany travelled to Greece and were welcomed by 9 members of JEF Greece and a guest from JEF Belgium doing his Erasmus in Athens. 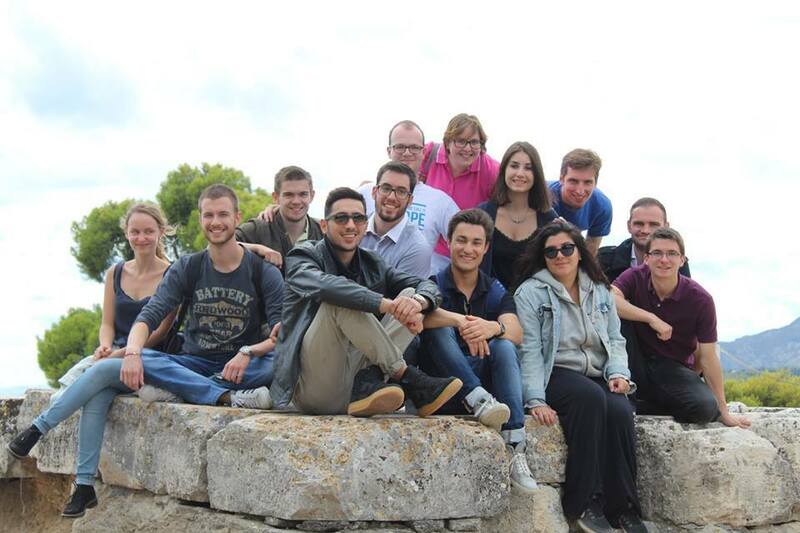 Altogether, the 20 participants had origins from Germany, Romania, Greece, Albania, France, Switzerland and Belgium. The project focused on the common history of modern Greece and modern Germany and on the dissolution of the stereotypes that Greeks and Germans have tended to have for each other during the years of the debt crisis of the Euro-zone. Our German colleagues in the week from 28th of September to 4th of October came in contact with the hubs of Greco-German cooperation in Athens and learnt a lot about German presence in the history of modern Athens and Greece, both positive and negative. Participants began their activities in the Greek Parliament with a guided tour in the building, that was the Palace of Otto and Amalia, the Bavarian royal family that Greece had in the 19th century and who shaped the modern Greek state. They were also guided in an exhibition about Ioannis Kapodistrias, one of the most prominent Greek politicians, who had proposed the unification of Europe already during the Congress of Vienna in 1815, when he was minister of foreign affairs of the Russian Empire. A conversation on the positive and negative influences of Otto and Amalia on Greece followed, before participants had the opportunity to attend the Plenary Session of the Greek Parliament on the topic of the proposal of privatization of the public company of electricity DEI. Then the Information Office of the European Parliament in Greece hosted the participants, who organized a workshop on stereotypes by making use of the online tool www.youthmetre.eu and came up with their own proposals of potential projects of Greco-German cooperation against stereotypes in the future. On the second day, members of JEF Greece and JEF Germany were guided for four hours around the streets of Athens and in the Museum of the City of Athens-Vourou-Eutaxia Foundation, in order to reconstruct the everyday life in the new capital that the Bavarian Administration had designed: Athens. Later on, they were hosted by the Zaatar non-profit organization in the Orange House for refugees, where they had a session of a living library on the various perceptions of the refugee crisis and the challenges of volunteering. The third day of activities was spent on the island Aegina, one hour away from Athens, so that members could visit the Temple of Aphaea Athena, half of which is on display in the Pinakothek of Munich, after the Bavarian royal family saved it from Italian smugglers of antiquities in the 19th century. The 2nd of October, participants visited the German Archaeological Institute of Athens, where they learnt about the contribution of the Institute to the archaeological research in Greece and the significance of the Greek culture for Germany, as well as the Embassy of Germany in Greece, where they had a conversation on modern Greco-German diplomatic relations and on the project of the Youth Agora Forum. On their last day, the participants from both countries toured around Athens and went sightseeing, making use of the application “German Traces” of the Goethe Institut in smaller groups. Linda Hamann, Robin Mudry and Jan Schiprowski organized the programme from the side of JEF Bavaria and Alexandros Apostolidis from the side of JEF Greece. The Blue-White Cooperation is a multifaceted project that is planned to last many years and, to begin with, members of JEF Greece will now return the visit to Bavaria in 2018 and there they will learn about local hubs of Greco-German cooperation and Greek influences in Bavaria and Germany.